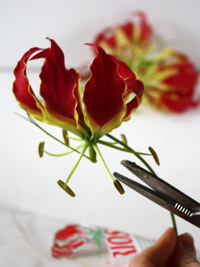 The gloriosa flower is perfect for a DIY tropical wedding centerpiece. It’s such a stunning flower that you really don’t have to do too much to it to create an original wedding decoration. 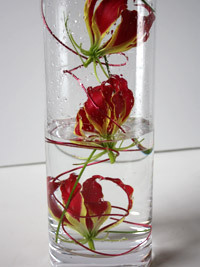 This tutorial submerges the flowers under water, which creates a really unique, and interesting design that I’m sure your guests will admire. 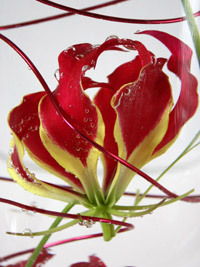 Take each Gloriosa flower and cut off the pollen and remove 1cm from the bottom of the stem. 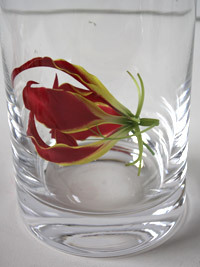 Place the first flower into the bottom of your vase. 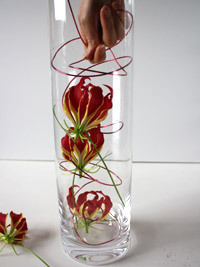 Twist the colored aluminium wire so that it spirals and place one end of it into the vase. Add another flower. 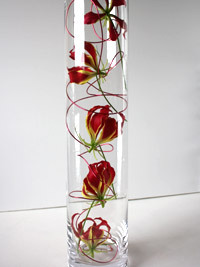 Keep adding flowers and wire so that you are trapping the gloriosa in-between the wire spirals without damaging the petals. Keep doing this until you get to the top of the vase. Cut off any excess wire. 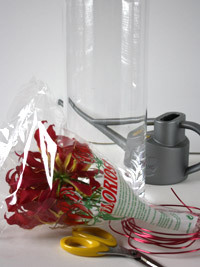 Gently fill the vase with water. 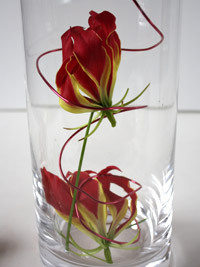 The gloriosa flowers should stay trapped within the wire, which prevents them from floating to the top of the vase. After a while the wire and flowers will be coated in little air bubbles, which gives them extra, texture and interest. The water also magnifies the flowers making them appear bigger than they actually are. You can place your tropical wedding centerpieces onto circular mirrors and surround them with tea lights in glass holders. "Stunning! Simple but classy, just what I wanted. Thank you."